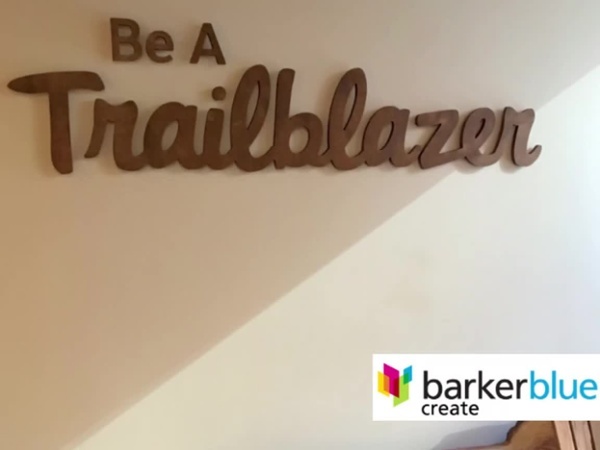 BarkerBlue is proud to have teamed with Salesforce throughout 2018 to help create display graphics and signs to recognize their Trailhead program, and celebrate the Trailblazers who completed their training path. "Trailhead is Salesforce's free online learning platform devoted entirely to teaching people to use Salesforce. Rather than spending hundreds of dollars on an IT certification or paying a couple of hundred grand to get a degree in IT, Trailhead is designed to democratize learning by providing free access to building Salesforce skills." (PC Magazine, January 19, 2018). With over 600,000 users, Trailhead is growing even quicker than you might imagine (think triple rates year over year!) People who finished training (aka Trailblazers) completed as many as 20 million challenges on the platform last year, and received 5 million badges in recognition of their accomplishments. There is no charge for anyone to use the Trailhead training. Learn how to become your own Trailblazer with Salesforce Trailhead, and hear perspectives from the Salesforce Trailblazer Community. Remember, every trailblazer can benefit from motivation, communication and signs to help bolster their pioneer spirit along the trail. That's where BarkerBlue Create can help. We're always honored to help design, produce and install the environmental graphics needed to inspire trailblazers towards their passion and path to success. Learn more at https://barkerbluecreate.com.